Are you still struggling with refrigerant recovery and ready to take our business (and your profits) to the next level? The ultimate step by step guide to refrigerant recovery for your scrap metal business. Well, you certainly won't have just landed your big payday. The call would likely end right there, and chances are they won't call you back. Businesses like this won't work with you if you're not capable and certified. BUT what if you could say "YES"? Being able to say YES gives you a whole new world of opportunities to profit from. Capitalizing on this could quickly add THOUSANDS of dollars in revenue to your business. Lucky for you, we created the Refrigerant Recovery Blueprint to help anyone willing do just that. Gain high-profit customers that generate loads of scrap far bigger than anything you'll ever find on the curb. Start profiting from scrap you would otherwise have to turn down or pay a professional to evacuate for you. Start reselling freon to reclaimers for huge profits and instantly increase your profit per appliance. Become an authority in your area and force local customers to choose you over your competition. And guess what? We can help you get started as soon as today! Believe it or not, it's a lot easier than you might think to get certified and equipped to evacuate refrigerant from everyday scrap. Maybe it seems too complicated or you don’t know how much it will cost or what tools you’ll need or just flat-out haven’t got the first clue how it all works or where to start. You don’t need to go to college or attend any classes. You don’t need to own any recovery equipment before you get certified. You don’t even need to have an actual “business” to get certified. None of that is necessary. No schools, no strange testing facilities, no complicated forms! Plus your certification is GOOD FOR LIFE. Pay attention because we’re not just going to guide you step by step into getting this certification, we’ll show you the ins and outs of how everything works, and how to quickly add massive profits to your business. We've got you covered with everything from getting certified to evacuating your first appliances like a pro and landing highly valuable new customers. Including an inside look at our own personal setup and equipment. Imagine cruising over the scale with your topped-off truck and trailer full of copper/aluminum radiators and barrels overflowing with twisted copper tubing from your last mother load of appliances. Loads like that aren’t just thrown in a dumpster or put out to the curb on trash night. They come from real customers and businesses who will only give their scrap to someone who's going to do it RIGHT. So what does it take to walk into a major appliance retailer or a big hotel, and walk out with a new client who calls you to come get 25 or 50 or even 100 appliances at a whack? The only thing standing between you and massively profitable opportunities like these, is a little bit of know-how and a few extra tools you could fit in the back seat of a sedan. And don’t even worry about how much the equipment will cost you. Because after we guide you step by step to getting EPA certified as fast as humanly possible, we’re not going to stop there. With some clever marketing strategies, we’ll show you how turn your new credentials into profits right away so your new equipment pays for itself before you even buy it. We want to give you everything you could possibly need to help you succeed with this and start getting results as soon as possible. Offer your services to massive, highly rewarding customers who are in desperate need of your scrap recycling services and don’t know what to do with their stuff. Places like hotels and apartment complexes with multiple appliances in every room that require regular maintenance and replacement. Make money charging fees for a refrigerant removal service. Who says you can’t make money on the side? This is a service with huge demand. Every scrapper without the certification and equipment needs it, and they need it bad! Sell refrigerant to reclaimers for $2/lb or more. Reclaimers purchase recovered refrigerant from metal recyclers so they can process it and make a profit by selling it again. Just like the rest of your scrap, you can sell your refrigerant too. Brand yourself as an authority and an expert in your field. People often carry a negative association with this industry thanks to the shady events you see in the newspapers. But you can prove you’re different by brandishing your new credentials, and give your prospects no choice but to choose you over “uncertified” competition. Eliminate the risk to your business. The EPA is cracking down more than ever on recyclers who don’t handle refrigerant the right way. Once you’re certified and equipped you’re good for life. And when it’s out of the way you’ll never have to worry or stress about business ending fines or arrest or passing up opportunities again when an appliance comes your way. Does all of that sound good? And that’s only a small glimpse of the opportunities available to you by taking this next step. We’re flat-out giving you everything you need to know and more, on a silver platter so you don’t have to spend one more day wondering what to do next. And since we know you’ll be wondering, we’ll show you how to actually evacuate your first appliances without a hitch - Step by step, beginning to end, first person view, with pictures of the entire process. We put it all into an exclusive, in-depth, easy to follow ebook complete with instructions and examples so you have absolutely nothing left preventing you from moving forward. Now is the time to stop procrastinating, eliminate all the risk to your business while taking it to the next level so you can become more successful. 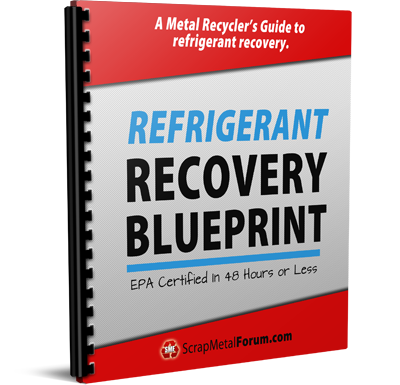 The Refrigerant Recovery Blueprint is a 74 page step-by-step ebook to becoming a fully equipped, knowledgeable EPA certified metal recycler by next week. Not everyone has a trusted mentor to sit by their side and help them through that process, but we've created this guide to provide that same type of shortcut. The shortcut to the next big step for yourself and your business. A detailed overview of the entire certification process so you know exactly what to expect. How to access EPA approved study guides and practice tests. How to take the test and how to make sure you pass on the first try! The Getting Certified module is the very beginning of your journey, by the end of this module you'll be armed with everything you need to know to get your official EPA 608 Type 1 Certification so you can legally evacuate and recycle scrap with refrigerant! And that's only the first module! A detailed overview of all the equipment you’ll need to get started and what you'll need as your business grows. How much will it cost for a basic setup and how to get started as cheap as possible - Just one good load of appliances stored away could cover the cost of everything! What each piece of your equipment does and how it all works. What kind of “maintenance” to expect with your new equipment. An insider look at our personal setup and the most ideal setup to start out with. Module 2 covers everything you need to know about refrigerant recovery equipment and how it all works. You’ll learn what tools you need to get started, what equipment we recommend and some important things you should know if you intend to buy used equipment. How to set up your equipment for an evacuation. How to prepare an appliance for evacuation. How to connect to an appliance and recover the refrigerant. How to quickly disconnect from one appliance and reconnect to the next. How to disconnect your equipment when you’re done. Detailed examples and images of the whole process. Module 3 will show you how to use your equipment and your new EPA certification to start evacuating scrap. This is where Modules 1 and 2 come together. To make this guide as valuable as possible we made sure to accompany all of the explanations with actual examples using some of the most common appliances with refrigerant. How to find a company that will buy the refrigerant you recover. How to maximize your profits from the refrigerant you sell. How shipping works and how to sell in bulk to increase your profits even further. How to locally exchange a full tank of refrigerant for an empty one if you need a new tank in a hurry. Module 4 will show you how to take your profits per appliance even further by selling every ounce of refrigerant recovered from your scrap. Depending on market prices, you could earn up to 25% more per appliance just from the recovered refrigerant alone. We’ll also share alternative options for recycling your refrigerants and how to exchange your tanks right away if you don’t have time to ship to a long-distance buyer. Module 5 is all about taking your new found knowledge, certification and tools to bring more profits into your business. We’ll show you some proven and effective marketing strategies that will help attract the customers who need you the most. The contents of this module will be kept a surprise until you get there! We’ve packed absolutely every bit of information, every step, every concept, every question you have from beginning to end into a single, no-holes 74 page manual. We're also giving you LIFETIME access to the private Refrigerant Recovery forums here on SMF! That's right, we're not just giving you this guide... You'll also have access to an exclusive private forum here on SMF where you'll always have a place to ask questions and share advice about refrigerant recovery with other members! What we're offering you today is the ultimate shortcut for anyone ready to take action, take that leap of faith and get to the next level. This is your opportunity to learn everything in a fraction of the time it would take you to learn and process it any other way. And yes, of course, there is a catch. Obviously we can’t just give this information away. But don’t worry because we’re not going to charge anywhere near what it’s actually worth. So we could easily charge $97 or more. And it would definitely be worth every penny. But refrigerant is a MAJOR part of the metal recycling business and we really want to see as many people succeed with this as possible. So for now we won’t charge the $97 we were considering, or even half of that! Forum members can get The Refrigerant Recovery Blueprint for just $27. That’s just $27 for your shortcut to EPA certified and evacuating your first appliances without breaking the law, and without hiring outside help. Click the button below to order now and take your business to the next level. * SALE * - Only $17 when you order TODAY! PS - You know how important and highly profitable it is to learn refrigerant recovery and you know this guide will help you get there. Plus you'll have lifetime access to the private forums here on SMF to help you out in case you get stuck. So order right now because this is a limited time offer and right now is your chance to get all of this at the lowest possible price. PPS - Don't spend one more day risking your business and missing out on huge profits by not investing in this offer right now. Tomorrow could be the day you get a call for an appliance mother load, don't miss out on that opportunity by passing up this offer and not taking this next step. Click here to order the Refrigerant Recovery Blueprint for just $27. This book was just what I was looking for. I stayed up late last night and read the whole thing after the family went to bed. You can read EPA documents until you are blue in the face, but they don't tell you how the job is actually done. The Blueprint goes through the entire process step by step so that an average joe 6-pack like me can understand. There are pictures too. We all like pictures. I'm going to go back now and read (again) the EPA document that the test is based on just to familiarize myself with it, because it's an open book test. Anyway, my point is if you are at all interested in pulling freon out of your appliances yourself, the e-book, is worth the money. After reading the blueprint I have no doubt I can do this and look like a big shot being "EPA Certified". Money is not the root of all evil, the love of money is. A little backstory. I run a Craigslist ad every couple of days and recently got a call about a "industrial" freezer with a bad compressor and a refrigerator. I declined the job because I didn't want to deal with the refrigerant. I lost out on money and my partner said he is trying to get HVAC Certified through his work out of frustration. I hopped on to SMF that night and saw the ad our admin had put up telling me he was going to be selling this eBook the next week. Funny timing. I waited the week for the post to come out and bought it immediately simply because the price was right and I wanted to know. I'm glad I did. The book is well worth the money. It basically holds your hand on the diving board until you get enough courage to just jump in. I was always confused about what I actually had to do to get certified. Here I am 2 hours later with a temp cert and my wallet card in the mail. The book not only allows you to understand the process of getting the certification, it also outlines the tools of the trade and the steps to take while recovering refrigerant from small appliances. All in all I paid under $50 total and spent less than 2 hours of my morning skimming the book and taking the test. I took my time on the test and was sure to find every answer in the training manual word for word (tip: ctrl+f is your friend). I didn't want to waste time or money. I can now start popping AC units open without fear of the almighty EPA and their fines (once I buy my equipment). I'm very happy with my purchase and advise anyone that was ready to get their feet wet to buy the book and jump in. The price is right for the information it holds. It's not a guide on doing anything over the top, but it is a guide to get you well on your way to making money on the jobs you keep passing up. Congratulations on the certification CTS, nice work! Now you tell me the ctr-f trick I had to take the EPA test twice, but I did pass. Never was very good at book learnin stuff. So that just proves that if a below average student like me can do it anyone can! P.S. I found a reclaiming facility nearby (at least their website says they reclaim refrigerant) so I'll be selling freon for profit soon!!! I will probably be called an idiot, but I paid for the e-book and I am not sure I was sent a link to download. Please forgive an old fart and help me out. Hello Todd. Paypal should have redirected you to your purchase right after payment was made, however you should have also received an automatic email with instructions on how to access everything. If the email didn't come through, please open a support ticket and one of us will take care of you asap! REVIEW: I have been licensed (Universal) since Nov of 2006 and a little before I had to put on dialysis. I have never put my hands on any of this equipment, recovery machine or even a manifold. Because of this I have also passed on the material that contains refrigerant. After purchasing and reading the ebook I believe I could safely perform recovery. I am impressed with this book written and brought to us by Mr. Admin. I envy those who are physically able to add this service to their scrapping services. I really do believe that many can find ways to make this a big part of their business, I know of at least one member who has been doing this successfully for years. Personally I think if you don't get this book and read it over you have missed out on a possible opportunity. I bought it knowing full well I should never lift a window A/C unit and only the refrigerator I should move is the one in my house and only enough to sweep under it. Ditto what Gunny said! Semper fi Marine, happy Independence Day!!! We received your ticket and have updated your account with the correct information so you should be receiving an email any time with access to the guide and private forums. For future reference, in addition to the email that is sent to you, Paypal should automatically redirect you straight to your download after payment, just make sure you click the "return to merchant" or "return to Scrap Metal Forum" link on the success page. Does this certification cover you for the whole U.S. or is it a state by state thing? Do you have to be a licensed business owner/employee? do you still offer the book. Paypal is saying order through the regular channel whatever that means? "Hello Todd. Paypal should have redirected you to your purchase right after payment was made, however you should have also received an automatic email with instructions on how to access everything. If the email didn't come through, please open a support ticket and one of us will take care of you asap!" Yea. But it never even allowed me to make a payment. I tried it a few minutes ago and it worked! Ready to start! Thanks for the reply. Nice. I like it. I read about Refrigerant Recovery Machine. And this is the best guidance, I have read ever. Thanks for sharing with us. Last edited by irisrei08; 06-09-2017 at 04:38 AM. Is this guide still available? Yes it is, Just click the add to cart button in the first post. I get sick of seeing freezers and refrigerators that I can't scrap so... I bought the book. Hello!! I am a newbie - New Member here on Scrap Metal Forum living in Central Florida. I can easily state that i've already gained a wealth of info from reading a number of others' posts as a "non-member" and was convinced to sign up. My question here is this; The cost of the E-book Refrigerant Recovery Blueprint is nominal enough and thus far I have been fortunate to have an EPA approved business drain my R22, 410, and 134 refrigerants from items (dehumidifiers) I am scrapping. My question is whether there is enough revenue involved from approx. 20 units a month (containing approx. 8 oz. 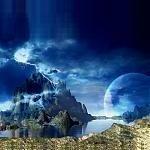 each) to go through the process? A proud new owner of an old Xerox 2515 blueprint printer. Now what?